Souvenior Shop Bali's Natural Soap Burat Wangi! The products are exported to Japan known as 'Masako Soap' products which are very popular in Japan. Burat Wangi produces high-quality and additive-free soaps with traditional methods using natural ingredients derived from nature, such as palm, coconut oils and other natural ingredients. 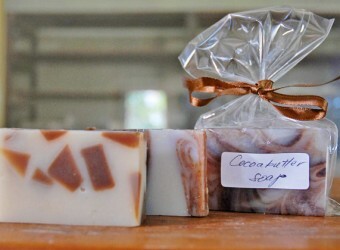 Natural soaps make your body fresh and clean. The products are sold at a reasonable price. Balinese Masako soap is great for souvenir. On this holiday I had shopping at Burat Wangi. I decided to buy soaps for my family as souvenir, it`s cute and is packed like cake, convenient to carry. There`s also the factory here, and the sales shop on the second floor. It`s really cheap.